Obviously, any ageplayers ordering products online will be most concerned about the packaging that their order will arrive in and Onesies Downunder understand that completely. Every package that has arrived from Onesies Downunder has been very discreetly packaged. This one arrived in one of those grey plastic clothing self-sealing bags. It had been folded multiple times to make it very strong. The package containing this bow arrived by international courier (DHL) and the customs form stated "clothing and toys" which is very discreet (it came with a pair of overalls and a pacifier clip). The best bit is that the sender was merely listed as "Andrew" with no mention at all about Onesies Downunder which gives you peace of mind about how discreetly deliveries are handled as obviously when purchasing products like this you don't want branded packaging. Deliveries are always discreet from Onesies Downunder. The bow is a simple product, but it looks lovely when worn. It consists of a bow and a hair clip to retain it in place. Now, Little Rae has short hair, and I was worried that the clip wouldn't hold it in place, but I needn't have worried. Even with her short hair, the clip held the bow in place even when enjoying some rough play. The hair clip is well made and is of metal construction. The durable spring holds it in place well, and Little Rae commented on how it didn't pull her hair, unlike some other hair clips she has so that is a good thing. 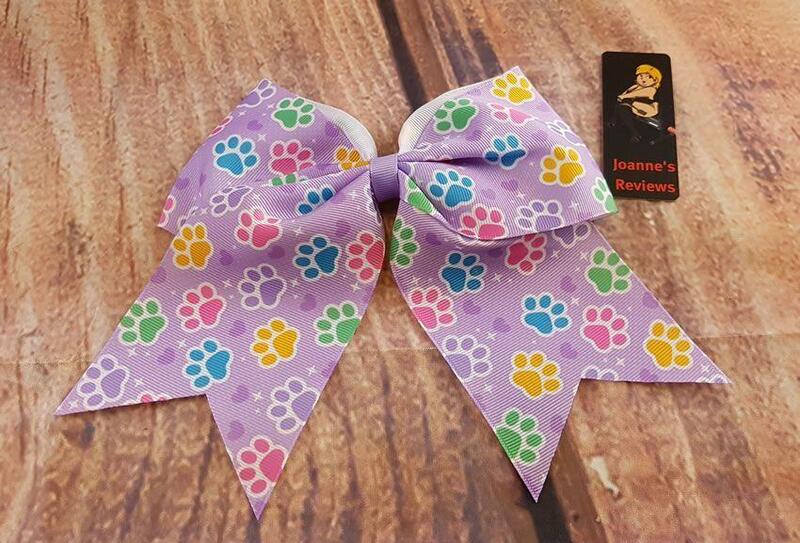 The bow itself is made out of a durable material, this one has the Paw Print design featured in the Paw Print Overalls we reviewed recently, and they go well together. The bow is only printed on one side which isn't a problem as you can't see the other side anyway, and that helps to keep the costs down. Talking of costs, I was surprised to see the bow retailing for just $9.95 AUD which equates to around £5.42 which is fantastic value for money. There are currently nineteen designs to choose from with some of them on special offer so you can even save on this already low price. The bow is elegant and securely attached to the hair clip. Little Rae loves the bright colours on the bow, and she has washed hers three times now by hand, and there is no sign of colour bleed. Indeed the colours are as bright and crisp as the day she removed it from its packaging. A bow like this one is a lovely addition to any little's attire and it can help to re-enforce ageplay due to its large size. It isn't overpowering though, Onesies Downunder has done an excellent job in designing a bow that is probably the perfect size for ageplayers to enjoy. It sits comfortably on the head at any angle and removing it is as quick as fitting it, so you can quickly change its position on a whim. I can't fault the Onesies Downunder Bow, with some fantastic and cute designs to choose from and a super low price you really can't go wrong. Little Rae loves wearing this one, and it suits her to a tee. When she wears her paw print overalls, it's a nice addition to that outfit. But, it could be worn to compliment any outfit. It is comfortable to wear, even with short hair and the sturdy hair clip holds it in place even when romping around and playing hard. If you get it dirty, it isn't a problem as it washes well, and the colours don't bleed at all which means this is a bow that you can enjoy for a long time. So what does Little Rae think of this bow? 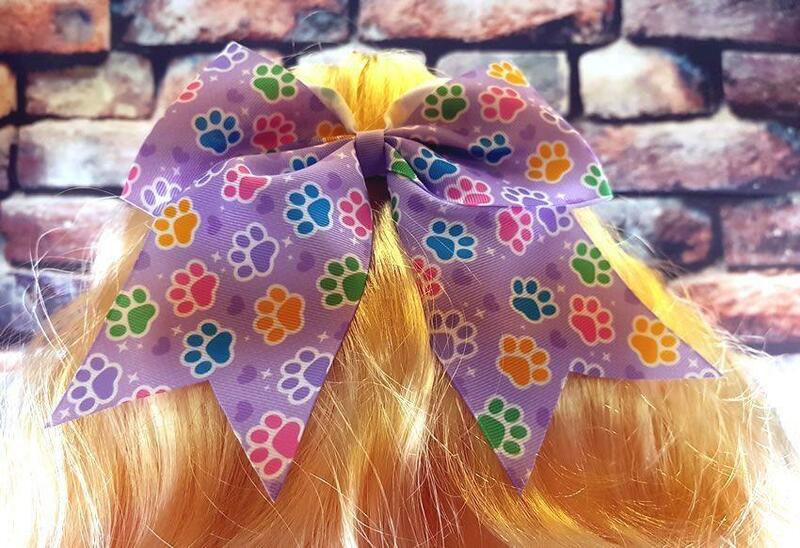 "I love this bow, it goes well with my overalls, and I love the paw print design. The ribbon is excellent quality, the hair clip is comfortable on my head, and it doesn't pull on my hair. I have got it messy (whoops) but it is easy to clean, and the designs on the Onesies Downunder site are yummy. When I put it on, it helps to make me feel and look little, and for that reason, I love my bow from Onesies Downunder." 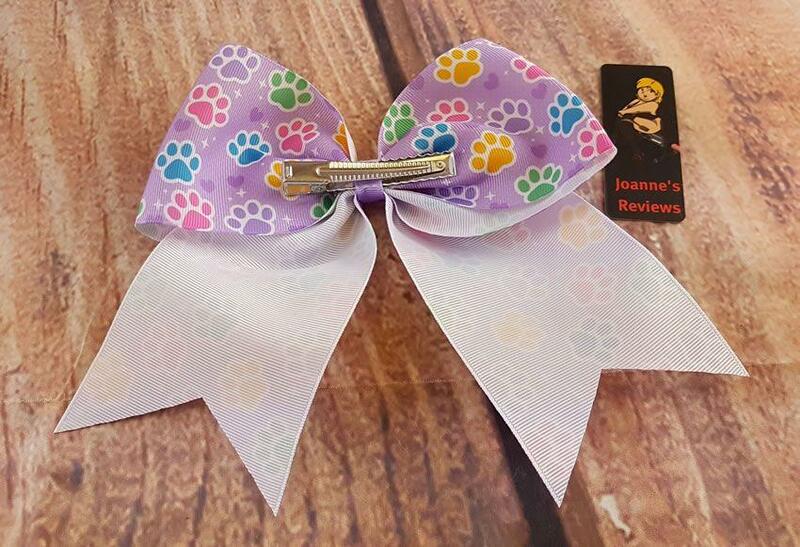 This bow is excellent quality, it has a low price which is a bonus, and the design is lovely. With eighteen other designs to choose from on the Onesies Downunder website, there is something to please everyone. With quality construction and attention to detail, it is an excellent product. It certainly looks good on Little Rae, and she loves it. Onesies Downunder have yet again impressed us with another fantastic ageplay product, check out the rest of the bow range and also their incredible onesies and leggings. Little Rae and I give the bow from Onesies Downunder a huge thumbs up and a strong recommendation. I was sent this bow by Onsies Downunder and I would like to thank them for giving me the opportunity to review it for them. 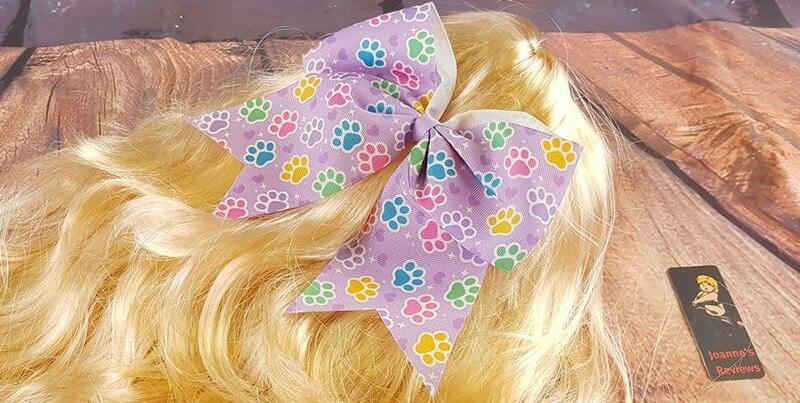 Grab one or more of these fantastic printed bows from OnesiesDownUnder for just $9.95 AUD (£5.42) which is fantastic value for money. The range features nineteen different designs to choose from. Check out the fantastic designs of their Onesies, Leggings and Bibs as well. I have no problem in giving OnesiesDownUnder a huge thumbs up and a strong recommendation for anyone in the DDLG or ABDL scenes. Little Rae loves their range of products.